Now here’s something a bit different! 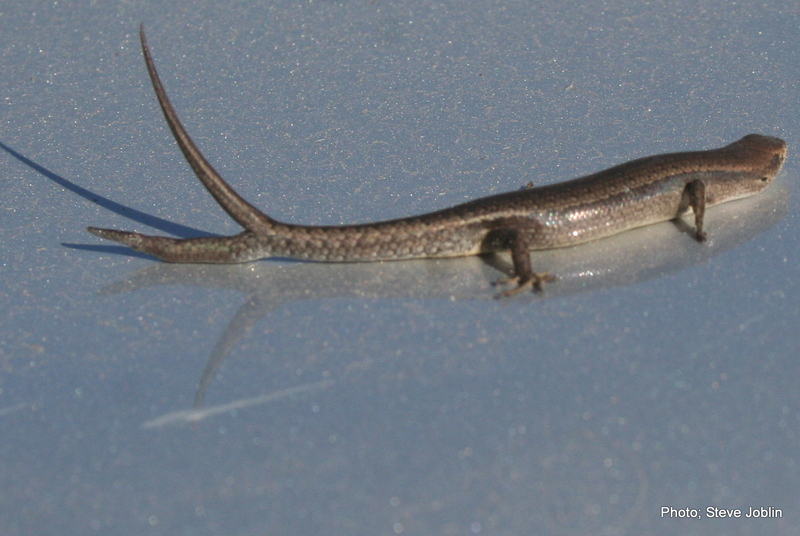 What we have in this photo is a common Garden Skink, found swimming in a backyard pool. Like many reptiles it is a pretty good swimmer. Unable to climb out, it was rescued and posed for this blog before being released into leaf litter where it would feel safer. Some of us are capable of dropping our ‘bundle’ in a crisis – many lizards have the ability of being able to drop their tails, i.e when they are about to become a meal, particularly for predators such as the Kookaburra and Grey Shrike Thrush. The mechanism of tail dropping involves the fracturing of the vertebrae and breaking off of muscles and blood vessels at the fracture point. The detached tail then goes into muscle contraction that distracts the predator while the lizard makes its escape. The fracture point on the lizard has muscles able to clamp and quickly close blood vessels. Over some months the tail will grow back without vertebrae but with cartilage as the underlying structure. The tail is an important asset to the lizard for storing fat, creating greater skin surface area to aid temperature control and assisting balance. Losing the tail is detrimental until a new tail is grown. What a great adaptation though to prevent the lizard from becoming a meal. In the case where the tail does not fully detach as in the photo above, a new tail will grow from the breakage point. So, we end up with a forked tail. Pretty Freaky! !